Erasmus+ is the European Commission’s educational programme for Higher Education students, teachers and institutions. 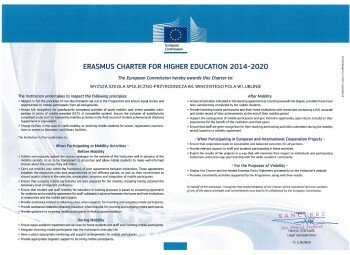 Erasmus+ aims to modernise and improve higher education across Europe and the rest of the world. It gives students and staff opportunities to develop their skills and boost their employment prospects. Good practices will be shared between universities and businesses. The scheme currently supports cooperation between the universities of below countries. – Attending workshops delivered by businesses. Students with special needs may apply for a specific ERASMUS+ grant after they have been selected for a mobility period. International Relations Office is ready to assist in the process. Students must be registered in a higher education institution and enrolled in studies leading to a recognised degree or other recognised tertiary level qualification (up to and including the level of doctorate). The students who want to study abroad must be enrolled at least in the second year of higher education studies! The payment of any national grant to outgoing students should be maintained during the study period abroad. Students may go abroad from 2 to 12 months. The same student may receive grants for studying or being trained abroad totalling up to 12 months maximum per cycle of study. Students must be registered in a higher education institution and enrolled in studies leading to a recognised degree or other recognised tertiary level qualification (up to and including the level of doctorate). Erasmus students are selected by their sending higher education institution in a fair and transparent way. Where do traineeships take place? Receiving organisations for traineeships can be any public or private organisations active in the labour market. Students may be awarded an Erasmus+ EU grant to help cover the travel and subsistence costs incurred in connection with their traineeship abroad. The payment of any national grant to outgoing students should be maintained during the traineeship abroad.